Tigerlily and My Daughter Now. I bought her when I was pregnant because I looked like a buffalo riding "piglet" my 1200 Sportster. Not that people didn't gawk when I rode up on "Tiger Lily" while 8 months pregnant but I felt better. Once my daughter was born the sound of my Thunder Headers would put her to sleep when she was cranky. She is a cutie and loves to ride. Unfortunately if I don't wrap a weight belt around her waist to hold her to the sissy bar she falls asleep and nearly falls off. The motorcycle is a H-D Heritage Softail. And Thunder headers are the loud pipes on her. Normally the motorcycles come with a quiet sound believe it or not. And people add louder mufflers because either they like that "Harley sound" (which was patented by H-D by the way). Or they want people to hear them coming for safety reasons or both. There are different types of pipes, different sounds. I had screaming eagles on my last motorcycle which was a H-D 1200 Sportster, but this sound is so much deeper...Richer. This is how it starts you know! You can already see the joy on your daughter's face. Pretty soon it will be "Let's go riding Mom!". Thanks for sharing your story & pic. Hi! This is a terrific picture. 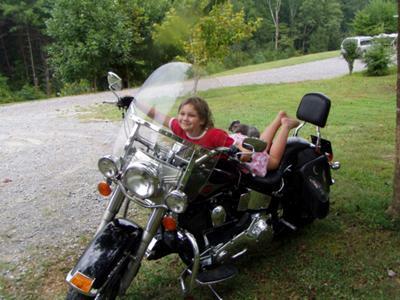 It's wonderful to see girls comfortable around motorcycles--it bodes well for the future. Excuse my ignorance but is the bike a Heritage or a Soft-tail? I can't tell these subtleties yet. And what are thunder-headers? Anyhow, it's a sensational photo any way you look at it. Thanks, Tiger Lily.